I was heading south on Water St. at exactly noon today when I noticed a big chair right in the middle of the intersection at 5th St. by Forget-Me-Not-Florist. It had fallen out of the back of a pickup truck. 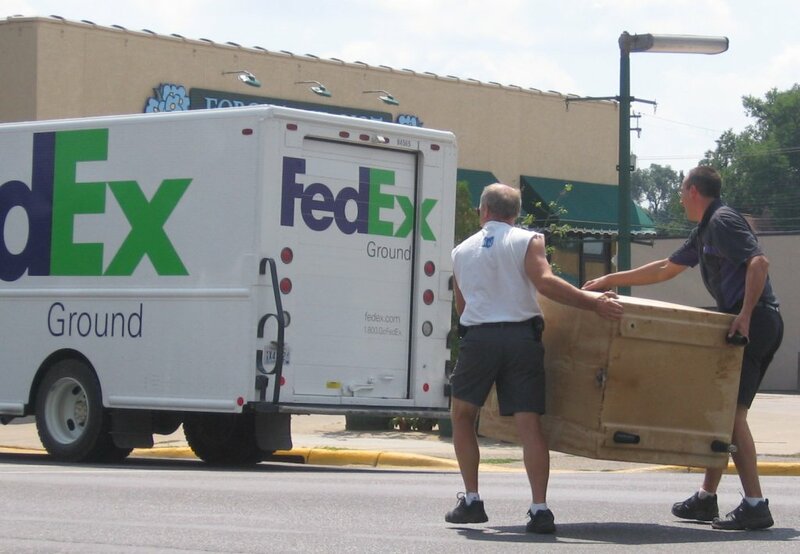 The driver of a FedEx truck that has just passed through the intersection stopped his truck and jumped out to help the guy load the chair back onto his pickup. Cool. Click photo to enlarge. If anyone knows the driver, tell him he’s been blogged by Locally Grown. And if anyone knows somebody who knows somebody at FedEd, email them the permalink of this blog post. Who knows what might happen. I did fill out a form on the FedEd website. I think that’s Bill, my regular FedEx driver (on the left…correct?). I’ll tell him! That would be my Uncle Clark. Atleast according to him. Really, Jeff? What’s his last name and how did he find out about this? I think if he wanted to let you know he would have. He posted the link to this site himself. Someone else told him. He just thinks it’s nice that there was an ad about it. Okay, thanks. We’ll just call him Uncle Clark, the good neighbor FedEx guy!